A ProPublica-National Public Radio report points out major discrepancies between how much a lost body part is worth under different states’ workers’ compensation policies — something well worth a read by both collision repair technicians and owners. The piece gives it a human face with the story of Jeremy Lewis, 27, and Josh Potter, 25, who both lost part of an arm in a factory accident. But Lewis received $45,000 in workers’ comp for the Alabama incident, while Potter, a Georgian, could ultimately make more than $740,000. It also noted the case of an Alabama sawmill worker who lost every finger except her pinkie on one hand, but was paid the separate benefits for a thumb and three fingers instead of paying the higher cost of what could reasonably be argued is in spirit an entire hand. 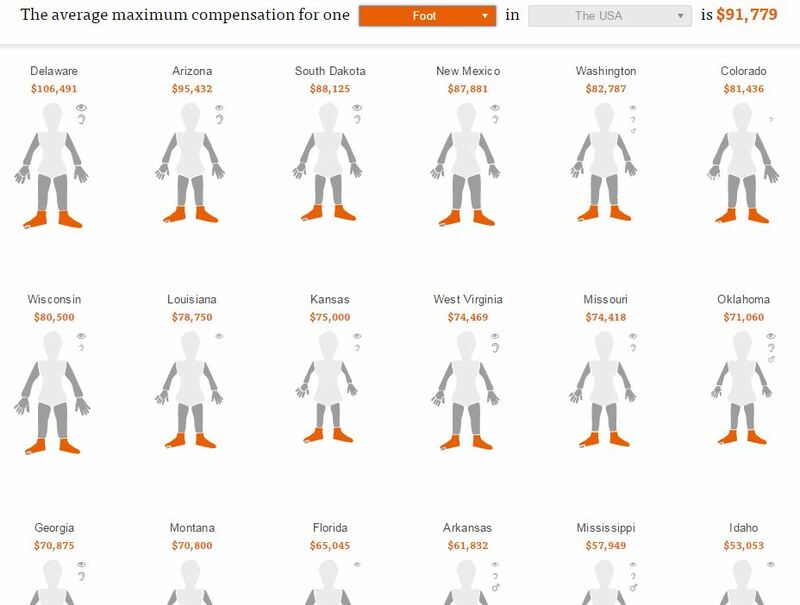 Click on the image below for a link to a dramatic ProPublica interactive allowing you to see what a limb, digit, eye, ear — even a testicle, in some instances — is worth on average in your state. While promoting a competitive business atmosphere by minimizing costs to employers is important, too much slack means that we all pick up the tab in the form of American tax dollars. The knowledge that a serious workplace injury might not bring adequate compensation might also deter newcomers to the industry in certain states at a time when collision repair is seeking to develop new technicians. A March 4 Occupational Safety and Health Administration study found that employers are paying the lowest workers’ comp rates since the 1970s and only covering 20 percent of the bill. The rest is borne by taxpayers — through not only occupational injury benefits but also Medicare, Medicaid and disability — and the employee’s family themselves. On the plus side, the number of deaths on the job has fallen since 1970, according to OSHA. Your odds were 18 in 100,000 of dying in a workplace fatality then; now, it’s 3.4 in 100,000. 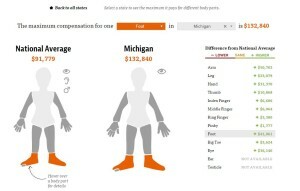 Featured images: Screenshots from ProPublica.org.